Having come into the 2013 racing season at the Oswego Speedway with high hopes of a small block supermodified track championship, North Carolina invader, Andrew Schartner, entered Classic Weekend out of title contention, but with something still to prove. A season riddled with accidents and mechanical woes, Schartner and his No. 18 Crow Motorsports team persevered. He continued to make the weekly trek up from Charlotte, NC and his crew continued to log the countless hours that it takes to field a competitive racecar. 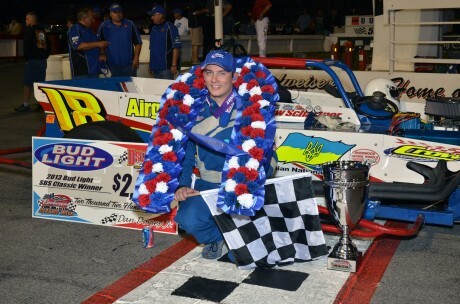 A prestigious victory during Race of Champions weekend in mid-July helped stop the bleeding, but Saturday night’s SBS Classic win helped make an otherwise sour season a seem a whole lot sweeter. Schartner took the lead on the opening lap and other than an early race hiccup in lapped traffic, led the entire 75-lap distance en route to his second Classic win. The “hiccup” in traffic may have actually been to his benefit. After getting pinned behind two slower cars, Schartner lost the lead to JJ Andrews on a dandy inside move that put Andrews’ No. 93 out in front – but for only half a lap. Losing second to Mike Bond as well, Schartner would find himself back atop the field soon enough. The very same lapped traffic that had cost him the lead ended up spinning out in front of Andrews and Bond, taking the top two time-trialers out of contention. Schartner would reassume the lead on the ensuing restart and successfully hold off multi-time race winner Russ Brown to earn the win. After time-trialing fifth, an inverted starting lineup put Schartner on the pole. A stutter step by outside front-row starter, Jason Simmons, paved the way for Schartner to take command early. Andrews, Simmons, Bond and Brian Sobus filled out the top five as the field completed its first lap. Bond would slip underneath Simmons to take over third on lap No. 3. Simmons would keep pace with the front trio of Schartner, Andrews and Bond at first, but would soon fade. Two laps after Brown bested Sobus for fifth, the caution flag would fly for Zach Amo’s spun No. 44. With 10 laps in the books, Schartner led Andrews, Bond, Simmons and Brown. Sobus, Jeremy Pitcher, Rob Pullen, Kreig Heroth and Jack Patrick completed the top 10. Schartner was solid on the restart, but just three laps into the run, Andy Noto spun alone in turn No. 2. Schartner held strong on the ensuing restart, but Andrews held close. By the 20th lap, the strong lead trio were closing in on the tail-end of the field. Just behind, Brown was working high and low on Simmons for fourth. 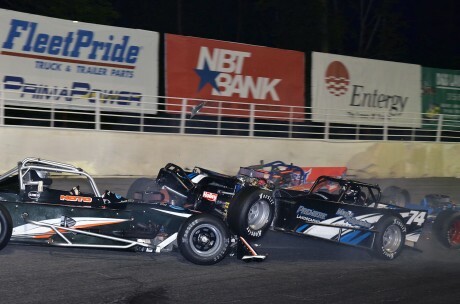 Just as Schartner prepped to lap the slower cars of Greg O’Connor and Noto, Noto took advantage of the passing flag to pull to the outside of O’Connor. Caught up high behind the lapped traffic, Schartner could only watch as Andrews shot passed his left side and into the lead. Bond followed the No. 93, moving into second. The next time by, Andrews would press Noto into the first turn and as the leaders entered the second turn, Noto’s No. 19 came around, collecting the race leaders. Schartner slid to a stop, but Andrews and Bond were not as fortunate. Andrews limped his damaged No. 93 into the pits. He would return to finish 11th. He admitted making contact with Noto on the front straightaway, but had backed off before the No. 19 spun-out. Bond caught some air time in his No. 74, suffering the heaviest damage. The race was over for the second fastest car in Friday’s time trials. After catching a wheel from the No. 93, Bond rides atop Noto’s No. 19. Schartner was able to restart back in the lead. 23 laps into the race, Schartner would lead Simmons, Brown, Sobus and Pitcher back to green flag racing. Simmons had nothing for Schartner on the restart, as the front three eased away from Sobus and Pitcher. 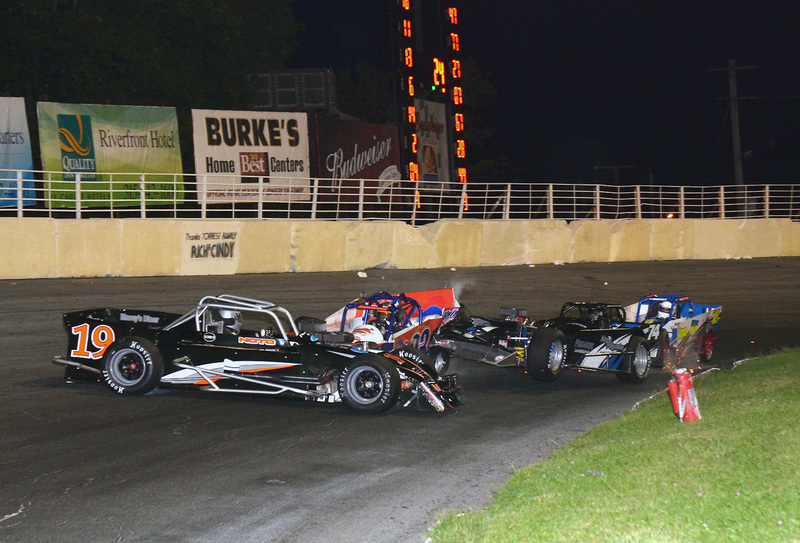 By the 30th lap, Schartner had put 10 lengths on Simmons and Brown. The Sobus-led pack trailed Brown by 20 lengths. Schartner pulling away only fed Brown’s assault on Simmons. The duo came together coming off turn No. 4 on the 34th lap, but both held on. Five laps later, Brown would use a sling-shot move off the same corner to finally take the runner-up spot away from Simmons. Brown’s pass came at just the right time, as the Sobus-led pack had just caught up to the duo. Brown would begin to pull away and chase down Schartner while Simmons would fall into the clutches of his chasers. Leading Brown by a full straightaway, Schartner began to catch the tail end of the field. However, before an opportunity for another turn of events could take shape, Amo spun his No. 44 alone off of turn No. 4. There would be no lapped traffic for Schartner, but his comfortable lead over Brown was erased. With 25 laps remaining, Schartner led Brown, Simmons, Sobus and Pitcher. Pullen, Heroth, Patrick, Anthony Losurdo and Dan Abt completed the top 10. Jon Tesoriero, Cameron Rowe, David LaTulip, Rob Humphries and Chris Proud filled out the top 15. Once again, Schartner was solid on the restart. Five laps into the run, he and Brown had put 10 lengths on the field. Among their chasers, Heroth’s No. 04 was just starting to find is beat. Passing Pullen, the defending track champion moved into sixth on the 56th lap. Two trips later, he dove under Pitcher’s No. 14 to bust into the top five. Sobus was next on his list, but a stalled AJ Bernys No. 24 machine brought out the caution flag. Schartner’s No. 18 continued to dominate on restarts. Again, the two would ease away from Simmons and Sobus. With the lap board ticking its way into the 60s, Heroth continued his late-race charge. Diving under Sobus, he took over fourth on the 61st lap. He would then chase Simmons for six trips before inching his way underneath to take over third. Heroth was finally ready for his an assault on the lead duo. However, while Heroth had been working over Sobus and Simmons, the two leaders had put a full straightaway on his No. 04. Heroth would need a caution flag quickly as only 8 laps remained. That caution would not come, nor would an opportunity for Brown to catch Schartner in lapped traffic. Brown’s No. 13 was too tight to mount a move on the race leader. Schartner would take the white flag with a half dozen lengths on Brown. Five-eighths of a mile later, he would take the checkered flag in the SBS Classic for the second time in his career. Brown would earn his 13th top-10 SBS Classic finish. It was the first time finishing in the runner-up spot for the farmer from Mannsville, NY. Heroth would simply run out of laps, the Fort Plain, NY resident crossed the checkered stripe with a strong third-place run. In the final eight laps, Patrick would leap from eighth to fourth. Bouncing back from a bone-jarring wreck two weeks ago, the Fulton firefighter was pleased with his run. Fighting an ill-handling car all evening, Simmons still managed to earn himself a fifth-place finish. Losing a top-five run to Pullen in the closing laps, Sobus finished right where he time-trialed, sixth.